A brief but pithy look at Chilean Death/Doom/Gothic band Aseidad's history, as founder Marcelo Vivallo talks to Comrade Aleks. "Here's a short glimpse into the history of Aseidad, an obscure band from Chile which started out in the mid-'90s playing Death/Doom, but returned after years of hiatus and inner transformation as a Gothic Metal outfit. 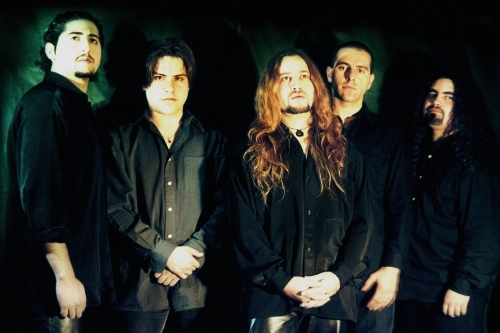 There's only one original member left from the Doom era, and that's vocalist Marcelo Vivallo". Aseidad original line-up: Mauricio Vivallo (Bass), Luis Moya (Drums), Marcelo Vivallo (Vocal), Victor Prades (Guitar), Patricio Saavedra (Guitar). Aseidad was formed in 1996: what was your vision for the band back then? How did this story start for you? We started as at the end of '94, but we recorded the demo in '96, with Patricio Saavedra (guitar), we were college classmates and we shared a rehearsal room. We decided to unite the bands of each one, being like lineup: Patricio and Victor Prades on guitars (today they play in Underneath) Mauricio Vivallo on bass (later formed Sarkus) and Luis Moya on drums (now Poema Arcanus). The first thing we did was to participate in a contest of Beginning Chilean Bands organized by the Semillero Rock and what we presented there was more heavy Rock, then when we started composing songs, it was more death doom, for the things we listened to. From Morbid Angel, Paradise Lost to Dead Can Dance or Tori Amos, but always with a darker, depressive and desolate atmosphere. Here in Chile there were few bands of that style and it cost a bit to generate an interest. But little by little it was achieved. You recorded Aseidad's first demo in 1997, how do you value this material nowadays? That Demo was done with a lot of effort, here it was very expensive to record, and very little support from labels in general, actually for the time it was fine, but now I find it very unprofessional, the good thing is that those songs we rewrote in '99 and they came out on the LP Autumn. (The Demo can be heard on thlink below). It took three more years to record the full-length album 'Autumn'. What was more difficult about composing these songs? What are your memories of this recording session? Was it a stressful or relaxed experience? We had a great time, there I have some VHS with the sessions, and we laughed a lot. There is even a Fail at a time when we had the studio door because it was a hot day and a drunken old man passed by and started dancing and taking off his clothes to the sound of the music ... we did not stop laughing, strip tease with doom ... The only stressful thing was that we had to record in an analogue way because the digital of those years compressed us too much and we spent more than expected. What's the album's concept? And how does autumn in Chile look? The concept was to reflect the melancholic, depressive, sadness, here in Chile the autumn is cold and dark which gave a good atmosphere to symbolize the theme of letters, that is why we use the dry leaves graphically, representing this state of spiritual exhaustion. You released the album on your own, was it so difficult to find a label? Yeah, in addition the commercial proposals here are too unfavorable for the band and the labels in general do not have much interest in this style in Chile. What happened after the 'Autumn' release? It seems that the band was put on hold, but nothing is clear about that. After Autumn I wanted to turn around what we were playing, The formation was Eric Birkner on bass and also as the main composer, together with JP Binimelis on guitar and Mario Chacana on drums. We played like this until 2007 and there we started experimenting with other styles, like Goth to darkwave, with influences like Diary of Dreams, Entwine, EverEve or To/Die/For. And then for reasons of personal conflicts we separated for a while. Aseidad current line-up: Carlos "Control" Cepeda (Drums), Johanna Sánchez (Keyboards), Marcelo Vivallo (Vocals), Pedro Fontecilla (Guitar), Eric Birkner (Bass, Vocals). Do I get it right that Aseidad reunited in 2015? How did you decide to return the band back to life? Was it easy to find all the members to complete the lineup? As I said before with Eric we took control and we had composed several songs that we had not recorded, we did not want to leave those compositions without registering - so we decided to join to record a new album, we looked for friends from other bands. Pedro Fontecilla of Decem Maleficum on guitar, Johanna Sanchez of Australis on keyboard, Carlos Cepeda of Denun on drums and Mario Maldonado of Robot de Mimbre as second guitar on live shows. You started as a Death Doom band, but second album 'Voice Of The Snake' shows far more influences. How did you put all of these together and compose that solid album? We are lovers of music, not fans of a particular style and we will do what we want to do, we were not thinking about making a Death album or a Doom album, The Voice of the Snake theme is more about spite, betrayal, cheating, living what we are not and that's why we gave him that more DarkGoth environment with the use of more Arabic tunes to have that cadence more associated with Mesopotamia or serpents. At this moment we are in a pause, each one doing other projects, but there are songs for another album, we will see with Eric when and with whom we will develop it. A great greeting and thanks for your interest. Interviewed on 2019-04-01 by Comrade Aleks Evdokimov.